Aug 26, 2014 @ 09:00 AM — by Sharon B. Mateja, D.D.S. It seems as though “smile makeover” has been a household phrase for an eternity now, but just 20 years ago, most people were unaware of the possibilities of cosmetic dentistry, let alone that they could dramatically transform their smiles, no matter what their conditions. These days, however, hundreds of thousands of people are taking steps each year toward achieving the radiant, healthy, attractive smiles of their dreams. Smile makeovers have helped to change the way people perceive a trip to the dentist’s office. Yet, many people still do not understand what a smile makeover is. Rather than being a single procedure that improves the appearance of the smile, it is a customized, comprehensive treatment plan that combines any number of cosmetic and restorative dentistry procedures. 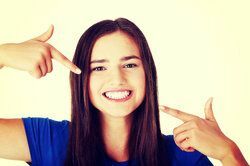 At the dental practice of Sharon B. Mateja, DDS in Rancho Cucamonga, smile makeovers are tailored to the unique needs and goals of individual patients, comprising those treatments necessary to producing the desired results. Just as no two smiles are alike, no two smile makeovers are alike. Which treatments will your smile makeover plan include? It depends entirely on the conditions affecting the appearance of your smile. The only way to know for sure which combination of treatments will be best suited to you is to meet with Dr. Mateja in a confidential, one-on-one consultation. The primary purpose of a smile makeover is to improve the appearance of your smile. If you have any serious oral health conditions, such as periodontal disease, tooth decay, root canal infections, jawbone deterioration, or gum recession, Dr. Mateja may have to address these issues before she can create your custom smile makeover plan. Chipped, cracked, or irregularly shaped teeth: Front teeth that are affected by these aesthetic flaws can be concealed by porcelain veneers, which are custom crafted to appear completely natural in terms of shape, size, color, and even texture. As an alternative, a dental bonding material can also be applied to the front teeth. Side and back teeth affected by these flaws can be entirely covered by porcelain crowns. Stained or otherwise discolored teeth: Teeth that have lost their natural luster can be dramatically lightened through professional teeth whitening. Teeth affected by discoloration that does not respond well to teeth whitening treatment can be concealed by porcelain veneers or crowns. Teeth separated by gaps: Gaps between teeth can be closed through the placement of porcelain veneers or the application of dental bonding. Missing teeth: Missing teeth present both aesthetic and oral health problems. These problems can be solved through the installation of dental implants, tiny titanium screws that are surgically embedded into the jaw to support crowns, bridges, and dentures. Excess gum tissue: When overabundant gum tissue extends down onto the teeth, it can make the teeth look abnormally short and create the appearance of a “gummy” smile. Dr. Mateja uses an advanced diode laser to painlessly remove this excess tissue, carefully sculpting the gums into a more aesthetically pleasing shape. To learn more about the conditions that can be corrected through smile makeover plans, please contact the cosmetic dentistry practice of Sharon B. Mateja, DDS today.